The PA83 is a high voltage operational ampliier designed for output voltage swings up to 145V with a dual () supply or 290V with a single supply. Its input stage is protected against transient and steady state overvoltages up to and including the supply rails. High accuracy is achieved with a cascode input circuit coniguration. All internal biasing is referenced to a Zener Diode fed by a FET constant current source. As a result, the PA83 features an unprecedented supply range and excellent supply rejection. The output stage is biased in the class A/B mode for linear operation. Internal phase com- pensation assures stability at all gain settings without need for external components. 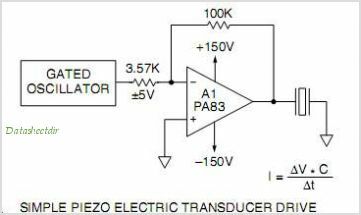 Fixed current limits protect these ampliiers against shorts to common at supply voltages up to 120V. For operation into inductive loads, two external lyback pulse protection Diodes are recommended. However, a heatsink may be necessary to maintain the proper case temperature under normal operating conditions. By Cirrus Logic, Inc. This is one package pinout of PA83,If you need more pinouts please download PA83's pdf datasheet. This is one application circuit of PA83,If you need more circuits,please download PA83's pdf datasheet.